A poll by YouGov published last Sunday at the start of Labour’s party conference put the party on 36%. 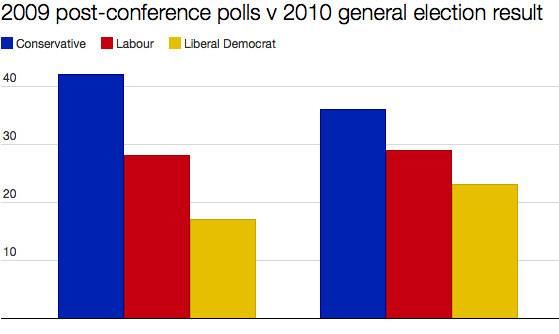 Today’s YouGov poll, published the Sunday after Labour’s party conference, puts the party on… 36%. No change whatsoever. Not a point of support gained – but no points lost, either. Labour will probably be more relieved by the latter than disappointed at the former. 36% would do very nicely indeed for the party were it repeated at the election. It’s higher than I, for one, am expecting. But is there anything to be gained from extrapolating opinion polls forwards from pre-election party conferences to polling day itself? 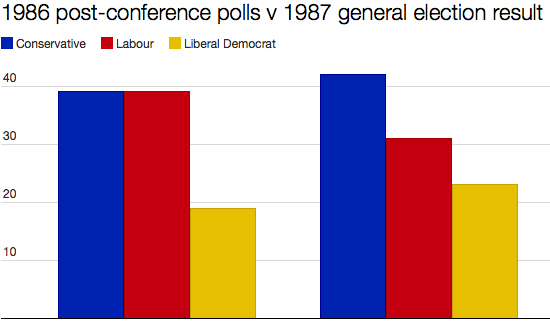 I’ve had a look back over the past 30 years to see if the state of parties in the immediate aftermath of the pre-election conferences is a reliable predictor of the subsequent election. By and large, it is. Of the seven general elections in the last three decades, five were won by the party that had a lead in the polls at the end of the preceding conference season. 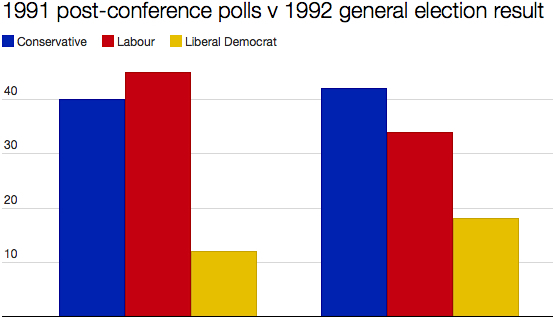 If a similar narrowing happens this time, the result will be a lot closer than the polls currently suggest. 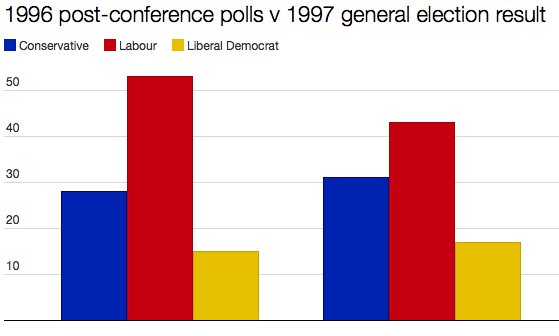 For one thing the gap hasn’t got that far to narrow before Labour is equal with the Tories. But for the 2015 election result to be anything other than a win for Labour (either in the form of a majority government or the largest party in a hung parliament), the Tories must not only pull level with their rivals but overtake – and by at least a four-point margin. In effect, for the Tories to win they need to increase their current share of around 32% to around 37%, while Labour needs to fall from 36% to around 32-33%. This scale of turnaround by a party in second place at the end of the pre-election conference season has never before happened in modern political history.